A chord is three or more notes played at the same time. Some combinations of notes sound especially good together, and have special names. You can write great songs with just a few chords and there are six standard chords you can use in each key. This example is in the key of C (it is the easiest to start with because there are no sharps or flats in the key). These six chords are in the diagram on the left. Three of these chords, I, IV, and V, are "major" chords, and are named using upper-case Roman numerals.Major chords sound happy, and uplifting. Many songs use only chords I, IV and V. The other three chords,ii,iii, and vi, are "minor" chords and are named using lower-case Roman numerals. Minor chords generally sound sad or dramatic. 1/ You can go from chord I (C in our example) to anywhere else. 2/ Once you're away from I, choose arrows to follow until you get back there. 3/ You can stay in one box as long as you like before moving on. 4/ If the same chord appears in two places you can jump between them. 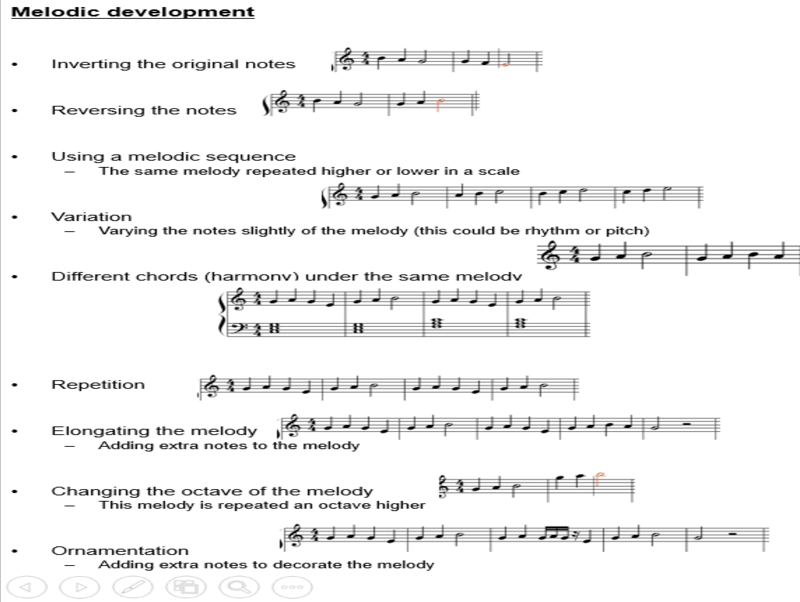 Once you have created your chord sequence you need to write a melody. ​1/ The notes of your melody should be based around the notes used in your chords. 2/ Use notes that are not in the chord too, particularly notes that are next to chord notes – BUT – move stepwise back to the chord note. 3/ Avoid too many big leaps in your melody. 4/ Use REPETITION & SEQUENCES in your melody. Even if you are just repeating a few notes. 5/ Think about the SHAPE of your melody. Most melodies don't just rise in pitch or descend in pitch. This would sound more like a scale than a melody. Most melodies rise and fall, often in an 'arch' shape. 6/ Pop songs usually have a chorus with a melody which is higher than the verse. This means that the verse ends with the melody rising.